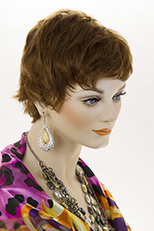 Flamboyant and fun, spikey shag style costume wig. See item details for available colors. Witches definitely need long black hair! 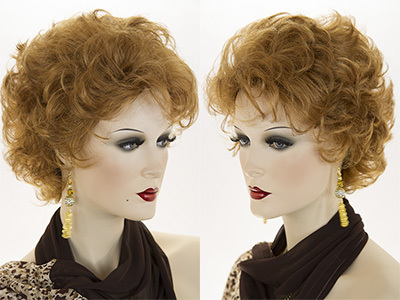 This fun wig will make your costume! 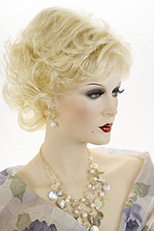 This lovely Up Do wig will be perfect for Mrs Santa, Geisha Girl, or a period costume such as Martha Washington! Use your imagination! See item details for available colors. Indian style long braided pig tails on each side. The hair is parted in the middle. Overall length is 24 inches. Available in black. Santa Clause wig and medium length beard with mustache! 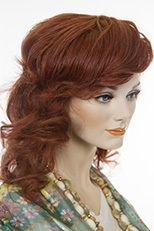 The wig is a classic cap made with wefts. The beard/mustache is one piece and is attached with elastic straps, which fit securely from the front to around the back of the head. The hair is made from modacrylic fiber. Long straight hair parted in the middle. Let your imagination be inspired to make the perfect costume! Maybe, in blonde it's Rapunzel or Lady Godiva? In black maybe it's a witch. 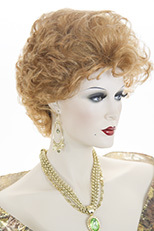 This lovely wig comes in a variety of colors. See item details for available colors. Heather II by Wig Pro. 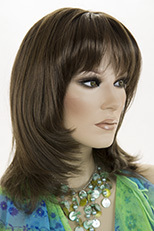 Long, soft, straight side swept hair with soft long bangs. Length: 23"-27" Overall, 5"-8" Front. Weight: 6.0 oz. See item details for available colors.